Sterifeed supply breast milk bottles to Neonatal Units, Special Baby Care Units and Children's Hospitals across the UK. Manufactured from BPA-free polypropylene, Sterifeed 50ml bottles will fit market leading breast pump flanges such as Medela and Ameda. Orders completed by 2.30pm (Mon-Fri) will normally leave our premises on the same day. Call us first if you intend to collect. A free standard shipping option is available on orders valued at £49.99 or higher. See our shipping service summary for detailed information on our various shipping services. 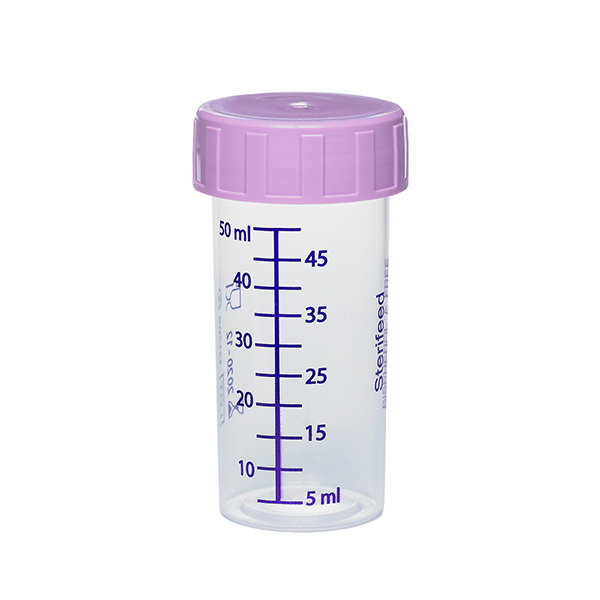 This product is supplied sterile, sealed in tamper evident packaging, ready to use. Resterilisation and reuse is not recommended. We stock the Sterifeed range of teats. There are standard, preterm and orthodontic teats in both latex and latex free materials. Each sterile teat is supplied individually wrapped ready for immediate use. The teat range is linked from the main menu at the top of this page. Sterifeed teat locking rings collars will also fit narrow necked (standard necked) bottles by Ameda, ARDO, Lansinoh, Medela and many more. They will not fit wide necked systems such as those marketed by Avent, Nuk and Tommee Tippee. Sterifeed disposable bottles will screw directly to narrow neck (standard) breast pump fittings by Ameda, ARDO, Medela and Lansinoh. They will not fit wide neck systems such as Avent, Tommee Tippee or Nuk. ©2014-2018 Richard Cassidy Limited. All rights reserved. Last updated July 2018 (E & OE).